I have AIW/cam editor by guitarmaen v4.05, but it does'nt work properly. I get only a graphical interface, I can't enter in the game. I see Madcowie video tutorial, but I have no success, just this very colorful interface. Can anyone a good, working link in AIW/cam editor v1.255? Maybe it works, I hope! Thanks any information, if give me! Madcowies video shows us how to use the RF1 inbuilt editor(the one that i cant use in Win10). 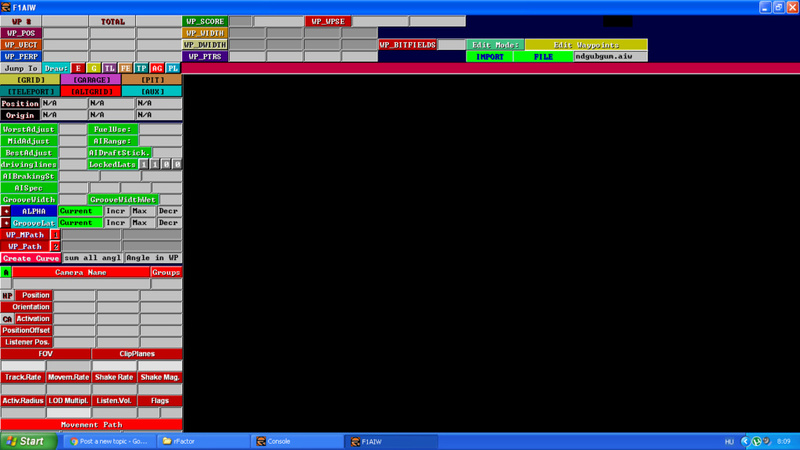 Guitarmaens version is a stand alone version that he released.This makes a graphical view( top view) of an existing AIW file and allows you to change it manually.Moving individual Waypoints to reposition the racing line. I dont think it will build a new AIW. I need a version that Madcowie uses... Can you give me a link? I can only dead links. Cowies version is part of Rfactor 1, not sure if it will work on its own. If you have a version of Rfactor 1 it will be installed already. Doesn't include my rF1... but download it again... we'll see. Can you give me a link? I can only dead links. Here is the rF AiwCam Editor mate. Oh mate, thank you, but I get an error message, the archive is damaged. I can't get it extract. Thank you very much, mate... if I make a good AIW, I'll send the track for my three helpers. FYI, use a separate profile when fiddling around with the AIW editor, as it can screw up your rF.